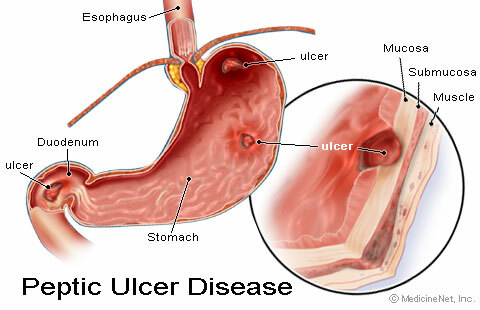 A peptic ulcer is a hole in the gut lining of the stomach, duodenum, or esophagus. A peptic ulcer of the stomach is called a gastric ulcer; of the duodenum, a duodenal ulcer; and of the esophagus, an esophageal ulcer. An ulcer occurs when the lining of these organs is corroded by the acidic digestive juices which are secreted by the stomach cells. Peptic ulcer disease is common, affecting millions of people yearly. Ramadan fasting has a healing effect on peptic ulcers as it curbs smoking which is recognised as a precipitating factor for the peptic ulcer. The whole gastro-intestinal system takes good rest for the first time in the whole year. I feel pity for the stomach. I really feel pity for the stomach, intestines and infact the whole gastro-intestinal system. And this is so because the whole year, we never let this system take rest. Apart from the three main meals, every few minutes, we pour something in our stomach, be it snacks, drinks, fruits or other eatables. None of us ever thinks that the food which we had already sent in before is being digested by the stomach and right when it has reached halfway, we dump some more into it only to disrupt the digestive work previously completed. This of course makes the food stay a longer time in the stomach which may result in dyspepsia, gastritis, irritable bowel syndrome etc. 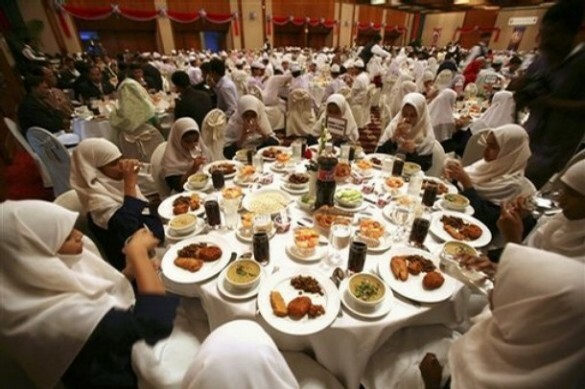 In contrast, Ramadan is the only period in which our gastro-intestinal system takes good rest as the Muslims observe fasting for the whole month. Digestion is not just the name of churning movements of the stomach and the absorption by the intestines, but it is a huge integrated system involving the nervous system (eg. vagus nerve) as well as hormone secreting glands. So the whole gastro-intestinal system takes good rest for the first time in the whole year. As digestion begins in the mouth where the salivary glands secrete excessive saliva which carries hormones to act upon the food, the burden on the salivary glands and teeth is reduced in the month of Ramadan. The oesophagus takes rest during fasting as there is no food to require its propelling movements which push the food to the stomach. Similarly, the stomach and the intestines also take good rest as after completing the digestion and absorption of food consumed at Sehri time, they have nothing to do till Iftar time. Even glands like pancreas and gall bladder which secrete hormones also reduce their secretions as there is no food to demand their hormones. Hence, there is substantial reduction in the gastrointestinal hormones like gastric juice, gastrain, gastric inhibitory peptide (GIP), motilin, vascoactive intestinal peptide (VIP),neurotension, enteroglucagon, neuropeptide Y, gallium etc. Lastly, the colon and the liver are also at ease during fasting. In short, Ramadan lifts the heavy burden and strain which we have put on our gastrointestinal system and gives it what can said to be a refreshing annual vacation of 30 days. Now coming to the diagnostic possibilities of Ramadan fasting, a good number of patients who consult physicians with abdominal pain, suffer from peptic ulcers. The peptic ulcer can be gastric or the duodenal type. The occurence of abdominal pain in both gastric and duodenal ulcers is different in relation to the food intake. Duodenal ulcer pain, though variable usually occurs when the stomach is empty and the gastric ulcer creates pain after the food intake. In normal days, the differentiation of the two entities is difficult to make as people eat frequently, but in Ramadan, an individual undergoes two stages. One during the fasting when his stomach is empty and the other after evening meal when the stomach is full. If the patient complains of abdominal pain while fasting, it will point to the possibility of duodenal ulcer and if the pain occurs after Iftar, then gastric ulcer will be the suspected diagnosis. The peptic ulcer pain is variable and it may not occur in some patients. Similarly, in most of the duodenal ulcer cases, as soon as mild pain starts, the patient eats something due to which the pain disappears and the disease remains undiagnosed. This undiagnosed ulcer may later surface with perforation of the ulcer and haematemesis (vomiting of blood) which has a high mortality. In Ramadan, while fasting, the duodenal ulcer pain is more likely to surface and as there is no provision to relieve the pain with food, the patient may be forced to consult a physician who with the help of endoscopy can easily clinch the diagnosis. While examining the abdomen of a patient who is already fasting, a physician can easily palpate the tenderness as well as feel the oedema around the peptic ulcer region. Ramadan fasting has a healing effect on peptic ulcers as it curbs smoking which is recognised as a precipitating factor for the peptic ulcer. It also has beneficial effects on inflammatory bowel disease, irritable bowel syndrome, dyspepsia and gastritis. For many more Ramadan Articles and photos from our archives, click here. I don’t think it’s a good idea for a person with gastritis or petic ulcers to fast. Peptic ulcers and gastritis are caused by increased production of acid in the stomach. If a person’s stomach who has gastritis or peptic ulcers remains empty for long the acid starts to act upon the stomach lining which can sometimes be very painful and cause serious problems like leading to bleeding or holes in the stomach. Telling you this from my experience. The pain is not the problem but not being able to fast is sad as I have a chronic problem. Have you tried honey or Manuka honey for this situation? I agree that if someone is sick fasting may not be possible. To Zawaj and the author of this article, jazakallah khair for sharing this post.